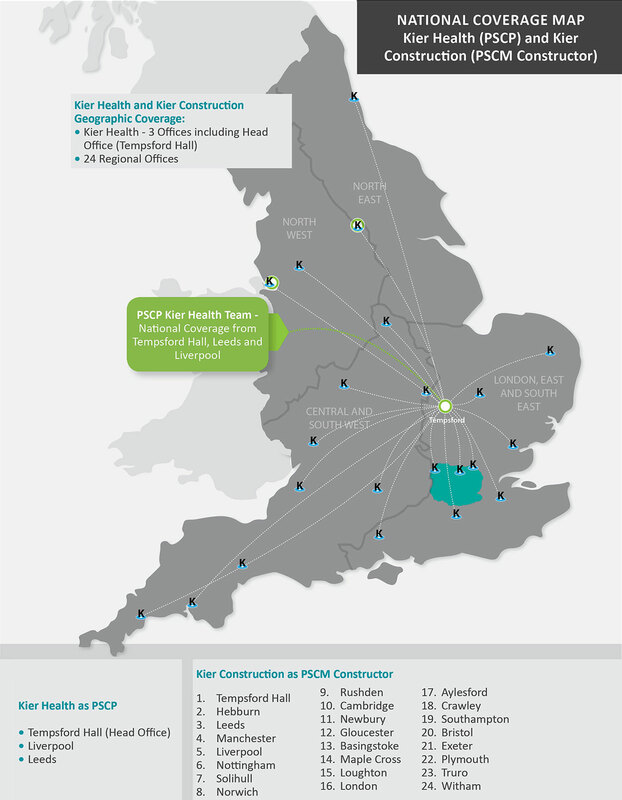 Kier Health was launched in 2003 to respond to the Department of Health’s ProCure21 Framework to deliver new and upgraded healthcare facilities across England, followed by the ProCure21+ Framework in 2010 and from 1st October 2016 ProCure22. Since 2003, Kier Health has been awarded over £2bn healthcare schemes through P21 / P21+ and P22. Delivering over 100 different clinical services including Radiotherapy Suites, Hybrid Operating Theatres, the full spectrum of Mental Health Facilities and new Health Centres that address the Department of Health’s 5 year Forward Strategy. The Kier Health Team, Led by Lewis Parker, includes Kelly Hemsley, Bid and Business Improvement Manager, Paul Spurgeon, Manager for the London and South East, Cheryl Parsons, Framework Manager for the Midlands and South West, Hughie Clarke, Framework Manager for the North, Chris Bird and Rianon Patterson as Bid Co-ordinators with Rosemary Jenssen, our Efficiency and Productivity Programme Champion. Neil Pates is our Senior Responsible Office across Kier. We have partnered with specialist design consultants, developing long term relationships and strong integrated teams to provide a ‘one stop shop’ service for strategic outline cases, through to outline and full business cases, estate and master planning through to design and construction delivery. Kier Health seeks opportunities throughout all its projects to introduce learning and evidence based design to deliver best value. We target the improvement of clinical, estate and facilities outcomes measures for our clients and their patients in every scheme we deliver. Mitford is located on the existing Northgate Hospital site in Morpeth providing 24 hour support and treatment for adults with complex and severe autistic spectrum disorders. It is the first building in the UK specifically designed for this patient group and is a pioneering project, requiring sector-leading, client driven design standards. The building includes residential accommodation for up to 15 adults, in single and shared flats within the four ‘fingers’ of accommodation. In January 2014, East Lancashire Hospital NHS Trust opened the doors of its new Integrated Urgent Care Unit at Burnley General Hospital (BGH). One of the first new units that encompassed the Department of Health’s drive to relieve pressure on accident and emergency departments through the creation of facilities to provide a seamless treatment pathway for minor injuries and out of hours GP care. The key element of the design process was to ensure that the patient experience was safe, efficient, providing a high levels of privacy and dignity whilst maintaining excellent standards of observation. Atherleigh Park represents a major transformation in the care pathway and overall estate rationalisation for North West Boroughs Healthcare (formerly 5 Boroughs Partnership) located in the heart of the Leigh community it serves. This ambitious flagship design was led from the outset by service users and staff, who have worked tirelessly with the Kier team to achieve what is already widely recognised as an exemplar for the future of mental health design. Please send all expressions of interest for Kier Health to: KierHealth.EOI@kier.co.uk. When your EOI is received we will send you a confirmation of receipt.